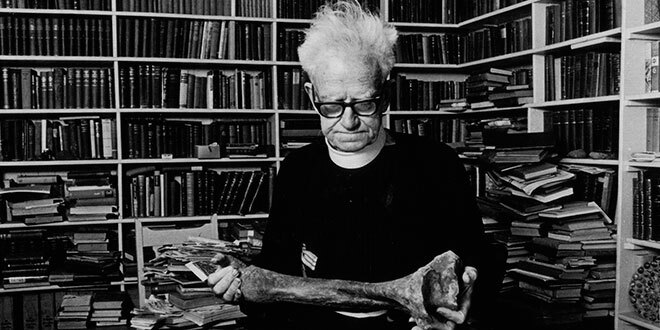 Collector clergyman: Fr Edward Hayes holds what is possibly a Diprotodon’s leg bone, with some of his books surrounding him. The Diprotodon was an ancient Australian marsupial. Photo: Courtesy of Catholic Church Archives, Toowoomba. FIFTY years ago, a humble Queensland priest handed over the most valuable collection of Australiana to the University of Queensland’s Fryer Library. Fr Edward Leo Hayes spent 71 years collecting tonnes of books, manuscripts, artefacts, and other rare and valuable items. This is his incredible story. LEGENDARY explorer Ludwig Leichhardt made a pit-stop at Rosenthal station, on the Darling Downs, in preparation for his next expedition across Australia. He was planning on crossing the country from the Condamine River in Queensland to the Swan River in Western Australia, but took a moment to visit his friends Frederick and Grace Bracker, woolgrowers in Queensland. When Leichhardt left Rosenthal for this ambitious voyage, he gave his hosts an autographed copy of his journal from Moreton Bay to Port Essington, writing: “To my hospitable friends Mr and Mrs Bracker in remembrance – Ludwig Leichhardt”. It was one of the last things Leichhardt wrote before he mysteriously disappeared on April 3, 1848. Toowoomba priest Fr Edward Leo Hayes had an interest in Leichhardt’s expeditions, and was often called on to give speeches on what was known as the “Leichhardt Days”. For this he glowed with pride but, without a doubt, he was more proud of the fact that he owned the book Leichhardt inscribed to Mr and Mrs Bracker. Rare finds: The inscribed copy of Journal of an overland expedition in. Australia: From Moreton Bay to Port Essington, which Fr Leo Hayes owned. Photo: Emilie Ng. It wasn’t his only prized possession. Esteemed poet Dame Mary Gilmore – or the woman on the Australian $10 note – once wrote a glowing tribute to Fr Hayes: “If God’s sun shines on kindness, it always shines on Father Hayes”. In her 1941 publication, The Disinherited, Dame Gilmore inscribed a message for Fr Hayes “who serves Australia through his collection for her – faithful in much and little alike – Mary Gilmore (Sydney, 8.1.42)”. The famous poet was taking inspiration from Luke 16:10, where Christ praises those who can be trusted with little because “they will also be faithful with much”. Another historic figure came bearing gifts at Fr Hayes’ doorstep during the Second World War. General Douglas MacArthur had been searching for the man who had access to rare maps of the Pacific, of which the American general had little knowledge. The search led to Fr Hayes, who happily supplied General MacArthur with the maps and books he desired. General MacArthur offered the Catholic priest a cheque in return but Fr Hayes refused it; he instead received a bottle of whiskey and a fountain pen. Fr Hayes used the fountain pen to write letters of all sorts to his parishioners, fans and friends, but he passed on drinking the alcoholic gift. Treasure: A copy of The Disinherited inscribed to Fr Hayes by Dame Mary Gilmore. It is part of the University of Queensland’s Hayes Collection. Photo: Emilie Ng. Collecting, it seems, was in Fr Hayes’ blood. Born in Frederickton, NSW, on November 23, 1889, a young Hayes caught his father’s love of book-collecting and reading. His first book was Captured by Indians, by Edward S. Ellis, which he bought for “one and six” when he was seven years old. In 1904 he left school, mastered shorthand and, when he was 14, went out to Toowoomba to work as a clerk for the Downs’ Co-Operative Association. While working in Toowoomba he signed up for Confirmation classes at St Patrick’s Cathedral, since he missed this initiation step living in the country. He received the sacrament of Confirmation under Monsignor Denis Fouhy, who urged the bright young boy to enter the priesthood. Within several years he received a calling to the priesthood, but was forced to wait until his 21st birthday to enter the seminary because his father refused consent. He eventually entered the seminary in 1910, studying at St Columba’s College, Springwood, and then at St Patrick’s College, Manly. His academic prowess resulted in wining the Cardinal Cerretti Medal for Dogmatic Theology, which added three books on the subject to Fr Hayes’ book collection. But it was while working in the seminary’s library, overseeing the care of 15,000 books that Fr Hayes’ dreamed of becoming a collector with international renown. By the time Fr Hayes died in 1967, he had amassed about 25,000 books, 30,000 manuscripts, press cuttings, book plates, stamps, coins, Aboriginal artefacts, guns and pistols, cattle bells, birds’ eggs, postcards and photographs. As well as a collector, he decided to become a geologist. He received a Gold Medal from the Royal Geographical Society of Queensland, and was enlisted as an ethnographer for its three expeditions to the Carnarvon Gorge in 1937, 1938 and 1940. Photos of the expedition reveal an important attribute of the priest: he is decked out in a black soutane and clerical collar. He was always, first and foremost, a priest. 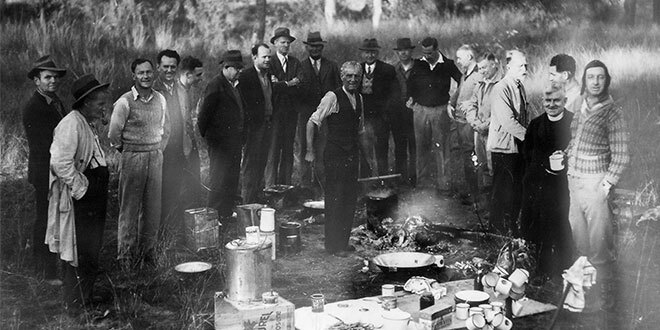 Priest geologist: Fr Hayes is decked out in a black soutane and clerical collar during the expeditions to the Carnarvon Gorge. There have been numerous descriptions of Fr Hayes during his lifetime and after. The Catholic Leader journalist Shirley Bell described Fr Hayes as “a gnome of a man”, while church historian Fr Chris Hanlon likened the Toowoomba priest to J. R. R. Tolkien’s Hobbit character Bilbo Baggins, who also filled his home with odd treasures. “(Fr Hayes) was a hoarder but it was never junk; it was always beautiful,” Fr Hanlon said. Literary critic Cecil Hedgraft, who consulted Fr Hayes’ book collection for his lectures at the University of Queensland, summed up the priest perfectly in a manuscript for ABC Toowoomba. “He never set himself to win hearts, but he won them just the same,” Hedgraft wrote. Fr Hayes seemed to understand this perfectly, that the more knowledge he had, the more stories he had for his parishioners, who longed to hear them. He served the parishes of Ipswich, Kilcoy, Taroom, Laidley, Crows Nest and Oakey, and his legacy was in building: he built churches and schools in all these communities. When Fr Hayes wasn’t hunting for a rare and valuable piece of Australiana, he was at the pictures. He went several times a week, sometimes to watch the same show in case it got better the second time, and it was not uncommon to see him mobbed by children inside the theatre. They all knew that deep in his pockets hid a mountain of black jelly babies, just for them. He learned as much about the world in the theatre as he did through reading books. 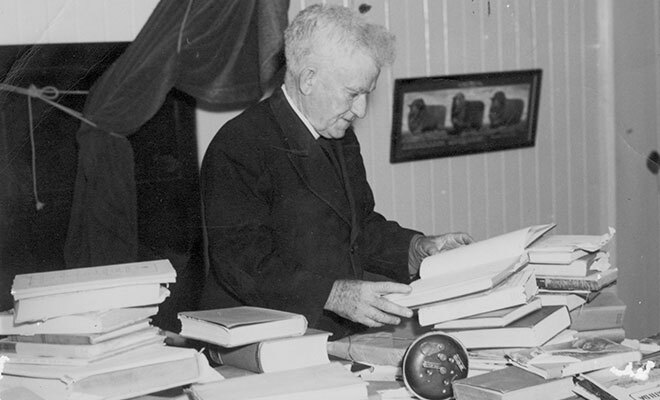 Immersed: Fr Hayes among his books in his presbytery at Oakey, around 1960. Photo: Courtesy of the University of Queensland Hayes Collection. Children and adults alike were mystified by Fr Hayes, who seemed to remember all his parishioners’ names, birthdays and special events. When a child within his parish borders received an award, even if they didn’t attend the Catholic school, he would write them a letter of congratulations. And all those who loved him wrote back. Among his incredible collection are boxes of personal items, including greeting cards and letters from parishioners and children. The Catholic Leader columnist between 1994 and 2011, Fr Kevin Ryan, said in a tribute newsletter to Fr Hayes that it was “a slack Christmas that didn’t bring six hundred cards”. 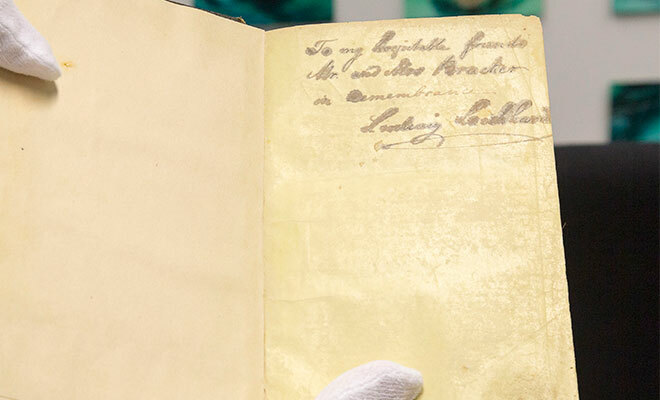 On October 19, 1967, about 119 years after Leichhardt autographed his journal for the Brackers, eight people turned up to Fr Hayes’ presbytery in Oakey, in the Toowoomba diocese, to gather his treasures. They called themselves “the collection squad” and their task was to take all of Fr Hayes’ rare and valuable items and transport them to the University of Queensland Library. It was all to be kept at the Fryer Library – the negotiations took more than two years to settle. In an interview with UQ, former library manager Marianne Ehrhardt credited Fryer librarian Nancy Bonnin, University librarian Derek Fielding and vice-chancellor Sir Fred Schonell with handling the great acquisition. The university may have also gained an advantage after awarding Fr Hayes an honorary Master of Arts at a ceremony at the Brisbane City Hall in April of 1967. Fr Hayes’ collection was known internationally, but it was the Catholic priest’s wish for it to remain in Queensland. A health scare in mid-1966 led Fr Hayes to sign a document entrusting the collection to UQ. 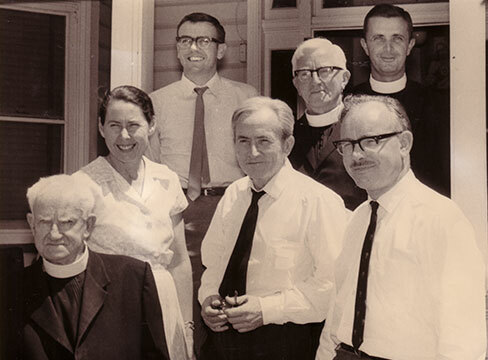 University gift: Fr Hayes (front left) with UQ Library staff and other clergy including Fr Kevin Ryan (top right) at Oakey in November, 1966. Fr Hayes handed over his extensive collection to the library soon after. Photo: University of Queensland. Former vice-chancellor Sir Fred Schonell was known to believe that Fr Hayes’ collection was the greatest thing to happen to the university in years, second only to the gift of land at St Lucia. When the collection squad came to take away the treasures, they were gobsmacked by the sheer volume of items. Ms Ehrhardt, who had joined the troupe on the first day, tried to open the door to Fr Hayes’ room, but instead struck a pile of books that blocked the entrance. “I had to crawl through the small gap we forced in the door and pass the books out in two and threes until we could get the door open,” she said. Unlike most collectors, Fr Hayes didn’t limit his collection to shelves; “in his room, books were sprawled over the furniture, on the floor, under the bed, all over the bed”. “I don’t know where Father Hayes slept,” Ms Erhardt said. Because of the sheer volume of treasures they found, it was easier to count the collection in tonnes rather than number of books or artefacts. According to Sir Schonell, the acquisition of Fr Hayes’ collection was a “weight of learning” coming in at 25 tonnes. The acquisition of Fr Hayes’ riches required at least four “pantechnicons” or removalists’ trucks, and two full days to reach the university in all its glory. It took the librarians several weeks to sort through the collection; even now items are still being brought into the university. The librarians discovered more than just books in the collections – there were also manuscripts, kicking off the Fryer Library’s first compendium of manuscripts and letters. The university acquired the collection for a cool 20,000 pounds, which was “doubted” to be an adequate appraisal of the items. 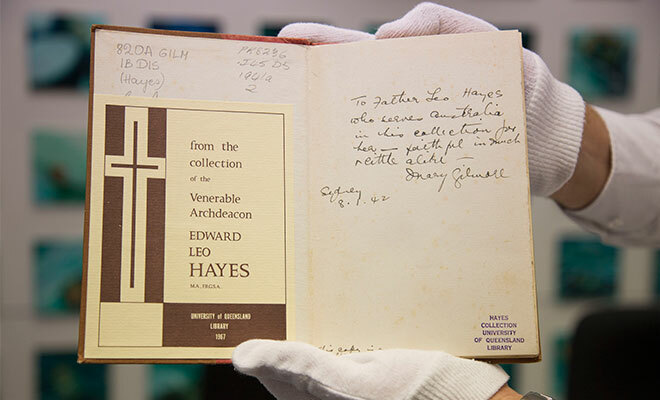 The university formally accepted Fr Hayes’ collection on October 26, 1967, just over 50 years ago. Today, the Hayes Collection is considered Australia’s largest private collection of Australiana. The collection is available to view at Fryer Library on the St Lucia campus. Fryer Library manager Simon Farley believes there is nothing quite like the Hayes collection anywhere in Australia. “People who knew about rare books and historical material really did understand this was an important collection of Australiana,” Mr Farley said. “It was considered in its day the largest collection of Australiana, private collection in the Commonwealth. “There’s that museum function of holding and preserving things that when you access them, you get a true connection to history in a way that you can’t otherwise. Fr Hayes never witnessed his great handover or what his collection looked like at the university as he died at St Vincent’s hospital, Toowoomba, on November 17, 1967, just five days before his 78th birthday. And, like his rare collection, we may never see anything like him again.